For those who have read my novel The Passions of Dr. Darcy, you likely recall an encounter Dr. George Darcy and his mentor Dr. Kshitij Ullas had with Tipu Sultan, the infamous ruler of the Indian Kingdom of Mysore. My two characters are the product of imagination. Tipu Sultan, however, was real… and a very scary man! Tipu was the son of Sultan Hyder Ali, and like many of the Indian rulers who craved absolute power and dominion, he was raised to hate foreigners and especially the British and the British East India Company. Their expansion across his father’s kingdom was an affront that resulted in four Anglo-Mysore wars. Hyder Ali led the first two wars, and the last two were under the banner of Tipu Sultan. Unlike his father, Tipu understood the importance of a fearsome image. Bengal tigers roamed freely, were the masters of their domain, and were vicious predators unpredictable in how they attacked. A truly magnificent animal perfect as a sigil to instill terror and respect. Although the tiger was an ancient symbol of kingship in India, Tipu made it his own, declaring it was “better to live a single day as a tiger than a thousand years as a sheep”. Thus, much like Louis XIV and his golden sun, Tipu Sultan cultivated an affinity to the almighty tiger, stitching its image on his standard, running its stripes along his soldiers’ uniforms, and placing its head on the hilt of his favorite saber. Even his gold and jewel ornamented throne bore the tiger’s shape. This sword bears numerous inscriptions on the blade showing it was a fighting sword that belonged to Tipu Sultan. Inscribed in six places on the blade in gold inlays with a Persian distich and Koranic verses. The hilt is covered with the bubri tiger-stripe emblem and two of the five tiger head terminals have jeweled eyes. 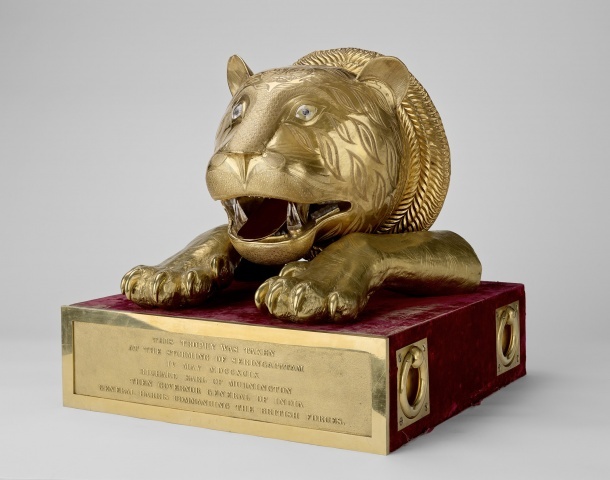 A gold tiger’s head ornament from Tipu Sultan’s throne, made from gold sheet over a wooden core, with finely chased and punched decoration, set with rock crystal eyes, rock crystal teeth and an articulated gold tongue, the mouth open as if roaring. Tipu Sultan, known as the “Tiger of Mysore”, reinforced this image in his palace and beyond, but the supreme representation of his attitude of superiority and disdain for the British wasn’t fully understood until the sack of Seringapatam in 1799. It was then, when many of his treasures were seized by the British, that Tipu’s Tiger was discovered. The automaton is close to life-size at 28 inches high and 68 inches long. The carved and painted wood casing represents a tiger savaging a near life-size European man. Mechanisms inside the tiger and man’s bodies make one hand of the man move, emit a wailing sound from his mouth and grunts from the tiger. In addition a flap on the side of the tiger folds down to reveal the keyboard of a small pipe organ with 18 notes. The video below shows Tipu’s Tiger in action. Okay, not as terrifying as you imagined, right? Well, time has taken its toll, and they didn’t have advanced electronics like we do! The next video is from the Victoria and Albert Museum, and gives a bit more insight into how the Tiger worked. Aside from Tipu Sultan’s hatred of all Englishmen, there were rumors that the Tiger was created to commemorate a specific event: Eleven years after the Second Anglo-Mysore War in 1781, the only son of British General Sir Hector Munro (who led the attack against Tipu’s father with resulted in the loss of over 10,000 men) was unfortunate to stumble across a sleeping tiger while on a deer hunt on Saugur Island. Hugh Munro died from the severe mauling the next day, and the pleasure of Tipu Sultan at this news was no secret. The images below are of the fully restored Tipu’s Tiger.